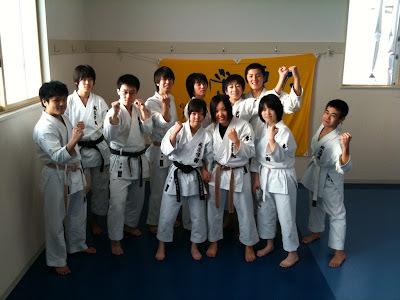 A Seiritsu tradition the last few years is to finish the last practice with 1000 punches and 1000 kicks. The 1000 punches took 14 minutes. The 1000 kicks took 29 minutes. We stand in a circle and each person counts 10 repititions. If someone screws up the count, they have to do push-ups. Of course afterwards, the students are quite happy it's over!